They are not particularly adapted to cold weather: they cannot traverse through very heavy snowfall without keeping to a path made by another animal first. Temperatures are also a problem, but they are capable of surviving them up to -35 °F (-37 °F). 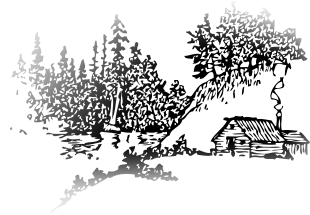 The individual family unit (known as a tent or "gio") typically consisted traditionally of three or four adults (a married couple plus siblings or parents) and any number of children. When resources were plentiful, several tents would travel together as a goum. They would have traveled as just one family unit most of the time. Bedouins have traditionally migrated in in-law-related domestic units or households in the spring and summer and converged with other near-kin households to live in bigger camps in the winter. The size of camp can vary between three tents or as many as 15. The size of the camp is often dependent on how much pasture is available for animals. The deserts can be quite cold at night. Bedouins build fires at night to keep warm. Would any of this be too contradictory toward the golden jackal's natural habits? I figure herding and the luperci virus could offer them more resources to group together, even if they don't naturally do so -- since they are more likely to travel in packs when there's plentiful resources. Last edited by Zaahira al-Ghul on Mon Nov 12, 2018 1:45 am, edited 1 time in total. Having a mount would certainly make travel easier for her, but yes, feeding the animal may prove difficult for her if the animal is not allowed to roam freely. Is it necessary that she have a mount? No. She could certainly still travel, though, without the ability to make her own, she would be limited to keeping to trails that have already been cut by other animals or Luperci. Having a helper -- whether its a native wolf or coyote, a hardy northern landrace dog, or a combination of these -- would absolutely improve your character's chances at survival during the winter months. An alternative to creating an NPC would be to reach out to current members by posting a request to our Thread Requests & Plotting forum to gauge interest. If you haven't already, you could also join our chat and meet new people there, too! Zaahira al-Ghul wrote: Also, would it be unreasonable to have a golden jackal operate in a Bedouin-like tribe and herd goats or camels? They would have traveled as just one family unit most of the time. Would any of this be too contradictory toward the golden jackal's natural habits? I figure herding and the luperci virus could offer them more resources to group together, even if they don't naturally do so -- since they are more likely to travel in packs when there's plentiful resources. Traveling in family units would probably be just fine, so long as they aren't too large or powerful. It's been many generations now since the Luperci gene was introduced to the Canis genus, and a lot has changed -- both culturally and biologically -- that would likely allow for differences in how the "natural" golden jackals might have lived in the time before Luperci. Mandi pretty much covered what your limits would be with a horse or with a Luperci companion! If your character is a shift-capable Luperci, they could also simply adorn cold-weather clothes (i.e. furs) to combat the colder months of Nova Scotia. 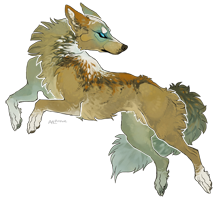 We've had quite a few jackals/jackal-dominate hybrids on the forum, and they don't require a companion to blaze trails for them beforehand. Sure, it's certainly easier, but, it's not a requirement. If this character is a non-shifter, navigating the snowdrifts would definitely be harder, as would trying to explain their ability to survive the frigid temperatures with their notably shorter coat. Either way, with or without a horse or cNPC to help them move about, so long as you basically account for the jackal's smaller size and need to, essentially, bundle up, in these colder months, you should be fine. Settlements are perfectly fine, as there are plenty that have been made here on 'Souls (both player-made and "Official"-made), jackals included. As Mandi mentioned though, I would try to NOT claim or allude to that, when these "tents" all combine together in the winter months, that their total number exceeds 50 Luperci. We have allowed for large "packs" or "groups" in the past in character histories, however, we don't like for them to be overly large x3 For comparison; the largest groups of Luperci in existence (i.e. the most populated “cities”) only number in the hundreds, and packs usually have 5-25 members. Milos Parhelion wrote: An alternative to creating an NPC would be to reach out to current members by posting a request to our Thread Requests & Plotting forum to gauge interest. If you haven't already, you could also join our chat and meet new people there, too! I assumed that anyone on the board would have been unable to help her find 'Souls since they'd be here already - but if it's not actually snowing now and she can make her way up here, that wouldn't be a bad idea. No camels or goats will be brought to Canada. This is more for background information; she's going to travel from northern africa to here for reasons unrelated to animal herding. Asura Creo wrote: If your character is a shift-capable Luperci, they could also simply adorn cold-weather clothes (i.e. furs) to combat the colder months of Nova Scotia. 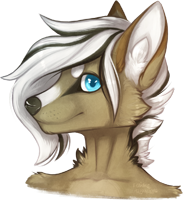 We've had quite a few jackals/jackal-dominate hybrids on the forum, and they don't require a companion to blaze trails for them beforehand. Sure, it's certainly easier, but, it's not a requirement. If this character is a non-shifter, navigating the snowdrifts would definitely be harder, as would trying to explain their ability to survive the frigid temperatures with their notably shorter coat. Oh, I thought it wasn't a matter of cold, but something with their paws not being adapted to snow that prevented them from walking across deep snow? Not sure where I got that idea, since reading over the guide, it doesn't directly mention their paws. She's luperci and I already planned to have her wear thick clothing to compensate for the cold. [list]Settlements are perfectly fine, as there are plenty that have been made here on 'Souls (both player-made and "Official"-made), jackals included. As Mandi mentioned though, I would try to NOT claim or allude to that, when these "tents" all combine together in the winter months, that their total number exceeds 50 Luperci. We have allowed for large "packs" or "groups" in the past in character histories, however, we don't like for them to be overly large x3 For comparison; the largest groups of Luperci in existence (i.e. the most populated “cities”) only number in the hundreds, and packs usually have 5-25 members. I think I can modify it so that doesn't happen, easily. As far as walking through the snow -- yeah, smaller paws might fall through the crust since they don't have the furry "snowshoe" paws, so she might plop down into deep snow, but this wouldn't be much of an issue if she was in her taller Secui or Optime forms. :) In Optime, it would be the same as a human traversing it -- annoying, but not impossible in all but the deepest snowdrifts! It's also worth noting that a horse would also be disadvantaged in said deep snowdrifts, so having a mount isn't necessarily a free pass. Song and Mandi have basically covered everything else! Just keep in mind what types of protection your jackal might need from the cold and moisture. I have a jackal character who wraps her paws with hide to prevent frostbite, for example, in addition to wearing warm clothing to compensate for her thinner pelt. Skoll Haskel wrote: As far as walking through the snow -- yeah, smaller paws might fall through the crust since they don't have the furry "snowshoe" paws, so she might plop down into deep snow, but this wouldn't be much of an issue if she was in her taller Secui or Optime forms. :) In Optime, it would be the same as a human traversing it -- annoying, but not impossible in all but the deepest snowdrifts! It's also worth noting that a horse would also be disadvantaged in said deep snowdrifts, so having a mount isn't necessarily a free pass. No mount, then, unless I just want her to have something to carry stuff with. I'm not sure she'd have the goods to trade for a horse or something like that, though, since I'm still trying to figure out her background. Paw-wrapping would solve another problem I'm trying to figure out. I want to make her obsessed with curing diseases (but her actual 'cures' are either common sense like bed rest, or they're superstition) without killing her. I'm fine with her getting sick and suffering some long-term detrimental effects as a result of it, but since she's already going to be dealing with the cold in 'Souls, I figure she can't come on board with anything that would make it too hard to survive. The problem comes with how lethal all the diseases I'm finding are. I plan to have one in her background to explain why she has this obsession in the first place, I mean, but, uh... if she's seeking out diseased canines to treat them, then she's going to encounter another lethal disease (besides the one that killed her tribe) again and I have to come up with an excuse for why she hasn't died. Complete hand-waving, with Zaahira either not encountering a disease like canine distemper, or somehow just not getting it despite being in proximity to it. Zaahira accidentally stumbles upon a method that prevents her from getting it, like being super-clean and covering herself from head to toe, and burning her clothing after coming in to contact with sick canines that she knows has the Super Lethal variety of disease. Being able to identify the super lethal variety of disease before she encounters them, via a teacher or someone else warning her. She immediately turns away those people and warns others not to interact with them. Maybe she preemptively kills them and burns their bodies? She's still a doctor, but she doesn't seek out diseased canines and instead shuns them and tells them that they're cursed. Some combination of the above? Would any of that be acceptable, or is this idea unworkable and I should start over with something else? Am I thinking too hard about this? Also, I found this thread while researching the disease thing. Are you all still fine with player-created diseases? I was initially going to go with Parvo for the lethal background disease, but then looked up the potential long-term side effects of surviving that and decided that I didn't want to play a character who had intermittent diarrhea. I think all of those options are acceptable within realistic constraints. For example, #1, handwaving a small number of encounters is probably fine, especially if done in combination with #2 or #3, but if Zaahira is able to pass through a lot of disease-ridden areas unaffected, you'd be treading into godmoding territory. And yes, as the older thread mentions, vague, non-specific diseases are generally recommended over specific real-life ones, as the latter requires much more research and checks for accuracy/realism. Players wishing to create very specific made-up diseases are recommended to let the administration know about details beforehand. Kyrios Lykoi wrote: I think all of those options are acceptable within realistic constraints. Alright, that works for me, thanks!